LASALLE, Mich. (August 10, 2018) – On Friday, over 90 sailors wrapped up a big week on Lake Erie and thanks to the countless volunteers from the North Cape Yacht Club these sailors enjoyed a fun and competitive week on the water with their peers. Friday’s racing produced three new champions at the 2018 Chubb U.S. Junior Sailing Championships, a US Sailing National Championship event. The Balboa Yacht Club’s David Wood (Corona Del Mar, Calif.) captured the Smythe Trophy in the Championship’s most closely contested event. Wood won by 14 points over Chapman Peterson (Winnetka, Ill.) who placed second overall. Lucas Sawin (Mount Pleasant, S.C.), who finished fourth at least year’s event, placed third this year. Wood wrapped up a great regatta on Friday with a scoring line of 5-7-2 over three races. He finished in the top five in seven of the 10 races this week. The Laser Radials posted two races on Wednesday with Wood taking the earl lead by two points. He extended his lead to four points over Petersen through five more races on Thursday. The top three eligible athletes in the singlehanded fleet will receive early acceptance to the 2019 U.S. Youth Sailing Championships. Trevor Davis (Arnold, Md.) and Rider Odom (Arnold, Md.) of the Severn Sailing Association won the Bemis Trophy by a 21 point margin after two more races on Friday. They finished strong with a 5-1 scoring line. Placing second was Hamilton Barclay (West Boothbay Harbor, Maine) and Ella Beauregard (Southport, Maine). They moved into second place on Friday with a strong showing to close out the regatta (7-2). Last year’s runners-up, Jack Egan (San Diego, Calif.) and Jack Plavan (Park City, Utah), finished on the podium again, this time in third place. Davis and Odom won five of the 10 races this week. There was little separation at the top of the leaderboard following Wednesday’s first three races of the Championship. The top four teams were separated by just one point each. Egan and Plavan had a one point lead. On Thursday, Davis and Odom surged in front from fifth place to take a 10 point lead after five more races. Egan and Plavan dropped to second place. The team of Douglas Wake (Sheboygan, Wis.), Ashley English (Sheboygan, Wis.), and Noah Bartelt (Howards Grove, Wis.) of the Sheboygan Youth Sailing Center earned the Sears Cup in convincing fashion. The Sheboygan team won six of 11 races this week on their way to a 27 point win. Placing second was Cameron Feves (Long Beach, Calif.), Christopher Salas (Rancho Palos Verdes, Calif.), and Justin Zmina (Rancho Palos Verdes, Calif.). Feves won this Championship last year in the Flying Scot with a different crew. He was fourth in 2016 in the Lightning. In third place was Grant Gridley (Milwaukie, Ore.), Christopher (Kit) Stoll (Mercer Island, Wash.), and Kieran Banyard (Portland, Ore.). Gridley, also with a different crew, finished sixth in 2017 and fifth in 2016. Wake got off to a strong start on Wednesday and took an early seven point lead through three races and a 2-3-1 scoring line. They extended their lead to 15 points on Thursday through five more races. Sailors raced in the open waters of Lake Erie, approximately due east of North Cape Yacht Club. The sailing conditions on Wednesday included light offshore winds at 5 to 7 knots and flat water. On Thursday, there was a light offshore wind to start, building gradually throughout the day to 10 to 12 knots. On Friday, the winds were onshore and stronger, approximately 12 knots, with typical Lake Erie waves due to the new wind direction coming off the lake. Sailors took part in onshore and on-water clinics with a collection of top coaches from around the country on Tuesday, August 7 to hone their skills and acclimate themselves to the racing conditions and the boats. Included in this year’s line-up of coaches was 2008 Olympic Gold Medalist and four-time Rolex Yachtswoman of the Year, Anna Tunnicliffe Tobias. US Sailing’s oldest championship featured three days of racing for the historic Sears Cup, Bemis Trophy and Smythe Trophy beginning this Wednesday, August 8. These highly-skilled young sailors representing their home yacht club or local sailing organization tested themselves against athletes from around the country in single-, double-, and triplehanded competition. First sailed in 1921, sailors compete regionally to earn an opportunity to race at this championship in one of three fleets. Competing sailors range in age between 13 and 18. Each Area is eligible to send at least one sailor/team to compete in each of the fleets for the 2018 event. Facebook Live – Follow US Sailing on Facebook for an archive of live video coverage from this week’s Championships. For final results and standings, photo gallery, and more information from the 2018 Chubb U.S. Junior Sailing Championships, please visit the event website. For a look back at breaking news and race results from the course, follow Twitter hashtag – #ChubbChamps18. Singlehanded – Faye Bennet Sportsmanship Award: Henrik Rolander (Terrace Park, Ohio) of the Cowan Lake Sailing Association. Doublehanded – Bemis Sportsmanship Award: Ian Reimel (Grosse Ile, Mich.) and Zoe Hoctor (Worthington, Ohio) of the North Cape Yacht Club and Hoover Sailing Club. 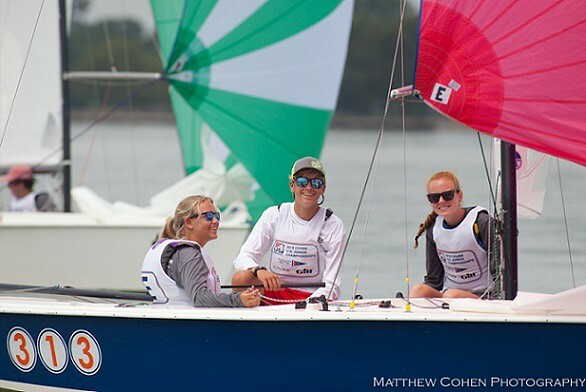 Triplehanded – Cox Sportsmanship Award: Lucy Brock (Austin, Texas), Julius Heitkoetter (Austin, Texas), and Taylor Snyder (Austin, Texas) of the Austin Yacht Club. The Seamanship Trophy was awarded to the triplehanded team for neatness and general ship-shape condition of their boats: Gabriel El Hajji (Honolulu, Hawaii), Adeline Ruiz (Ewa Beach, Hawaii), and Ryan Murray (Waimanalo, Hawaii) of the Waikiki Yacht Club and Hawaii Yacht Club. This event is sponsored by Chubb Insurance Group and Gill North America. Chubb, a long-time supporter of this championship and youth sailing, has been title sponsor of the U.S. Junior Sailing Championships for over a decade. Member insurers of the Chubb Group of Insurance Companies form a multi-billion-dollar organization providing property and casualty insurance for personal and commercial customers through 4,000 independent agents and brokers worldwide. Since its founding in the seaport district of New York City in 1882, Chubb has been a leading insurer of marine-related operations. Chubb provides comprehensive insurance and loss control services to private yacht clubs, marina operators and yacht owners. Chubb’s global network includes branches and affiliates throughout North America, Europe, Latin America, Asia and Australia. More information on Chubb may be obtained at www.chubb.com. Gill was an idea born on the water. In 1975 our founder, Nick Gill, was a keen sailor who utilised his father’s factory in Nottingham to begin production of truly capable sailing apparel. Kit that could be both protective and comfortable. We develop and test all our garments and we’ve grown to become one of the leading marine apparel brands in the world. We’ve equipped round-the-world teams when they’ve won prestigious ocean races, as well as Olympians to get them on the podium. Inspired by our nautical heritage we’ve also developed lifestyle clothing that can be worn anywhere, but which is still engineered with a marine pedigree. Today our garments utilise a range of cutting-edge technologies, from Activated Carbon baselayers to SuperFabric™, the most abrasive-resistant fabric in the world. At sea, saltwater comes at you from everywhere, so our clothing is tested in-house and on the water to withstand the very worst.